Henfield – creating a sense of space, seclusion and enveloping comfort. Our clients had moved into their modern house a year before we met them. 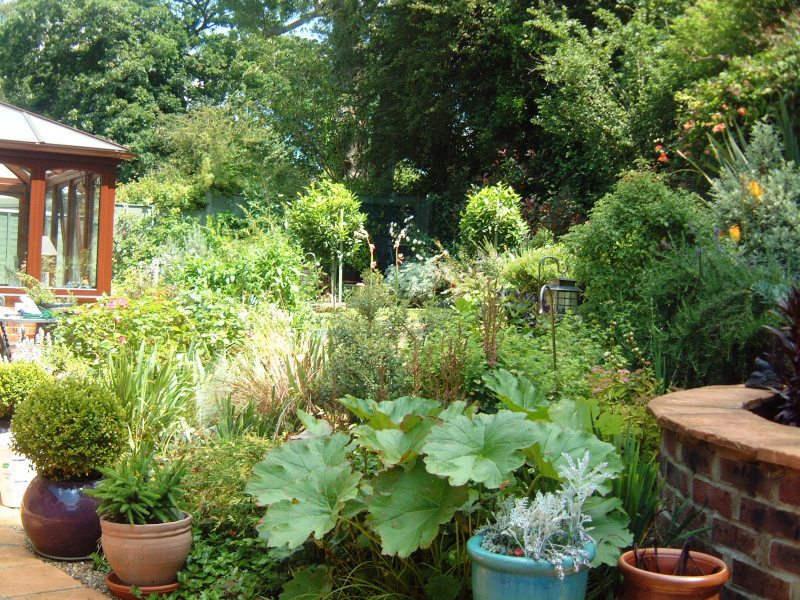 Despite their being keen gardeners, they were overwhelmed by the challenges of turning the garden that they had acquired into their own private oasis. Like many houses in a village or urban setting, this one had a network of fences and walls between it and adjacent plots, which were functional, but not beautiful. The garden sat on a steep slope, with just a single point form which one could see the countryside beyond. 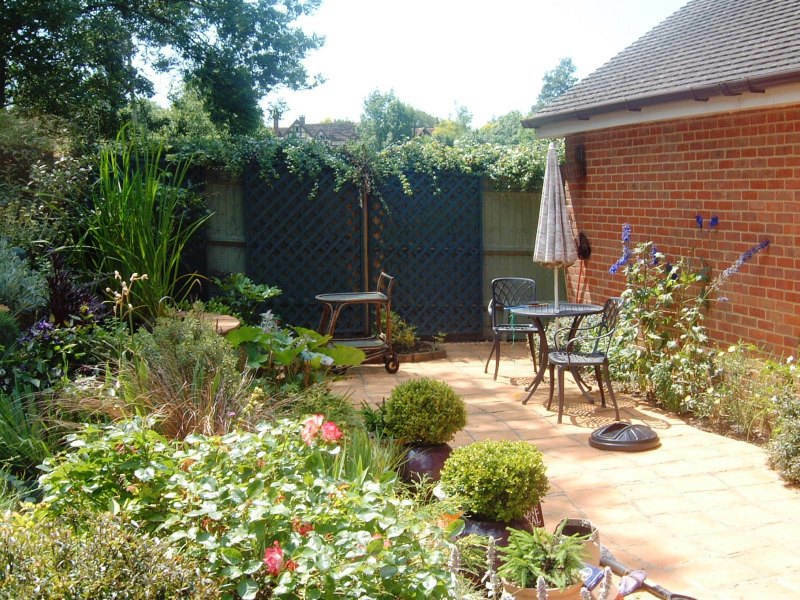 Our brief was to come up with a series of phased moves that would gradually turn this into a beautiful garden, with a strong sense of space and seclusion, where our clients would be able to relax and enjoy varied, interesting and attractive plants. Previous owners had constructed a low, but massive and unsightly, brick retaining wall right in the middle of the garden, so this seemed like a good place to start! Demolishing and removing it would be expensive and disruptive, so we determined to re-purpose it imaginatively. 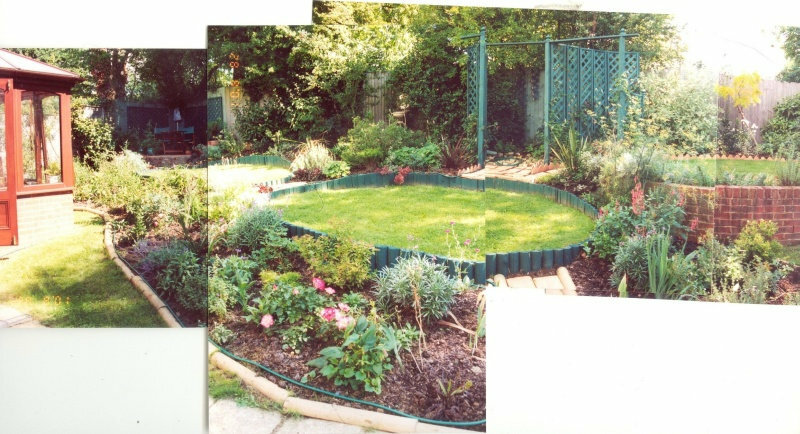 The idea that we came up with was to use it as the back wall for a lovely, raised semi-circular pond with a paved edge for sitting. 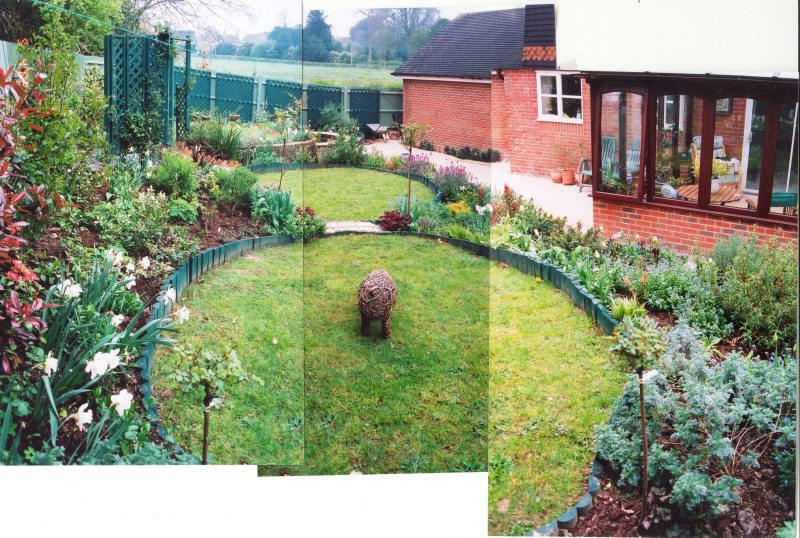 We then designed a series of terraced lawns with planting around them to deal with the sloping land in between. At the top of the slope, we made a delightful seating area, from which to take in the view. By changing the whole orientation of the garden, we made it feel spacious without the earlier sense of a regimented square. To deal with the problem fences, we painted them a soft, pastel tint that toned in well with the garden. As a final touch, we dressed them with trellis panels, specially adapted to the varying angles that we encountered. 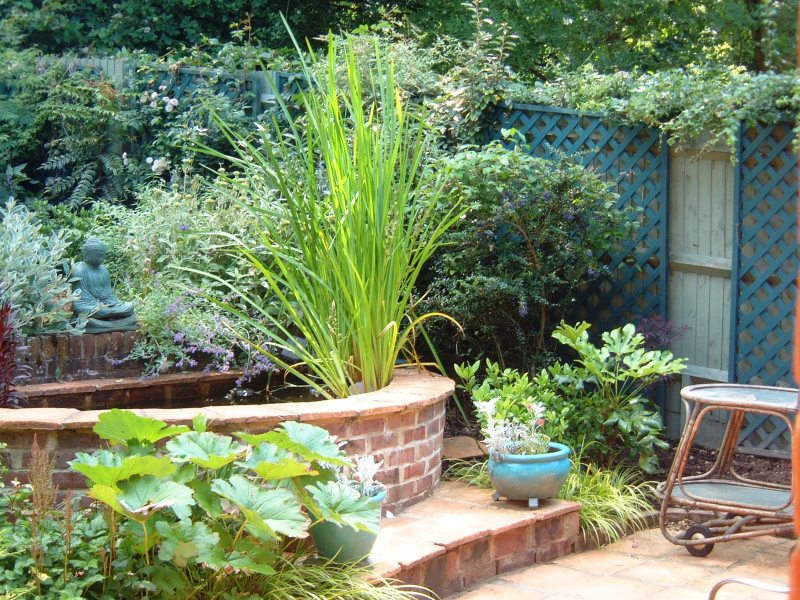 Because our clients were experienced gardeners, communication between us flowed easily. We were able quickly to agree a breakdown of the entire project into the required smaller steps. For each step, we agreed the concept, developed the detail, estimated it, planned and executed the work, using a minimum of drawings. 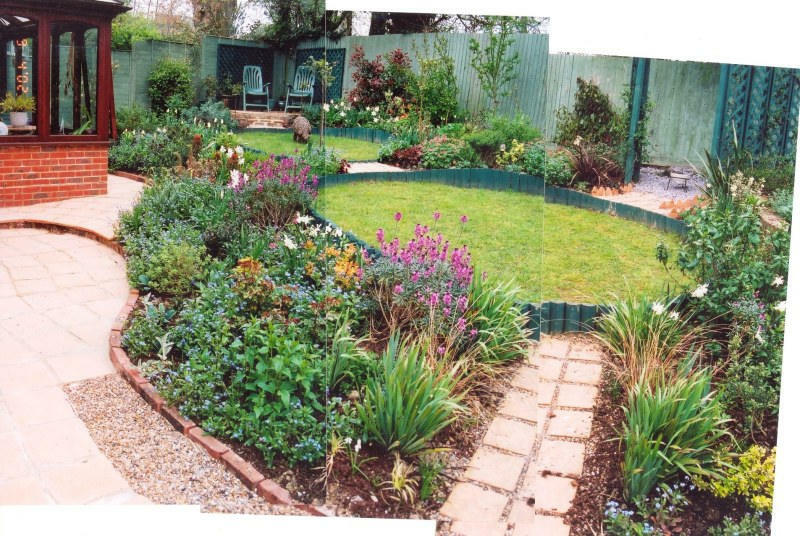 A view of part of the finished garden. The dense and varied planting creates interest and privacy, yet it also makes the garden spacious in a way that belies its true size. The garden feels lush and boundless. 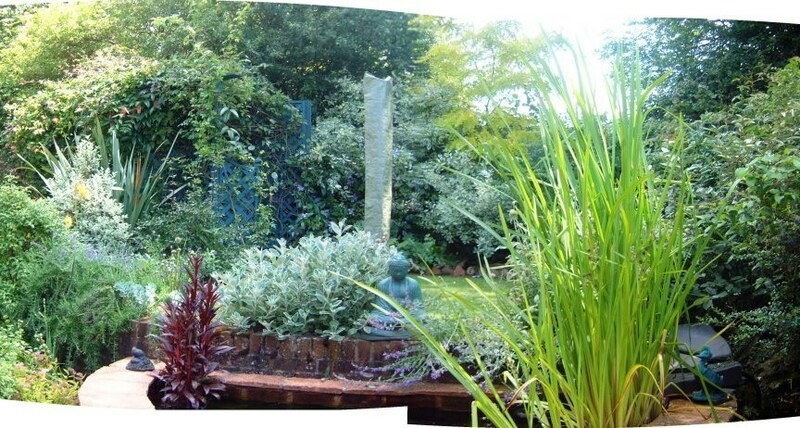 Another view of part of the finished garden, showing the raised pond. The new, raised pond is gentle and rustic. The old, odd retaining wall is no longer an eyesore. Instead, the pond incorporates it, which incidentally greatly reduced the cost of constructing the pond. The garden as we found it. Bare and bleak. The top of the retaining wall can be seen in the foreground. You can also see here how we set out the shapes of the proposed oval terraces with rope to give the client a sense of how this would work in practice. It is very easy to refine the design at this stage, of course. We initiated each phase at a time to suit the client, with a clear shared understanding of what each phase would deliver. We find that many of our clients prefer to have such control of progress and the cash-flow implications of the work. This makes for a pleasant and straightforward collaboration, which minimises disruption and stress. The terraces – phase 2. After we had terraced the lawn, we prepared the beds and spent time with our client to shop for the most fitting plants and shrubs. We invited a number of contractors to quote for building the curved terrace. As can be seen here, we put in temporary edging so that meanwhile we could get on with the gardening and the plants could get on with growing! The terraces start to take shape. The paved terraces have been laid, and the planting has already had time to grow and fill out, giving the garden a sense of maturity. It already looks much bigger than before, and the top terrace looks inviting. The view from the top terrace, a little later in the process. The lawned terraces’ sunny green ovals contribute to the soft, gentle feel of the garden. The view in each direction is interesting and beautiful. Our client, a keen gardener, is already enthusiastically exploiting the new and different planting opportunities. The lower terrace - a calm place to relax. We chose this terracotta-style paving to complement the pleasingly warm brick of the house. Just before the odd brick wall is given its new purpose. Seen from the lower terrace, the brick retaining wall is ugly and disruptive. Sadly, it does nothing to hide the dull fencing behind. This view shows another example of our use of rope economically to explain to our clients the future scheme. The garden is now lush and the varied textures of the planting make it both attractive and interesting. It brings much pleasure to our client. The retaining wall is no longer an eyesore and the depressing view of the fence is gone. A closer look at the raised pond. The pond is deep enough to create a healthy environment for fish and water plants, both of which can be enjoyed by sitting quietly on the edge! The warm glow and curves of the terracotta terrace are continued in the brick walls and seating forming the pond. Behind, you can see the attractive, adapted, painted trellis. In this view up the terraced lawns to the seating area, the beautiful, attractive plants are growing well with a distinctive opulence. 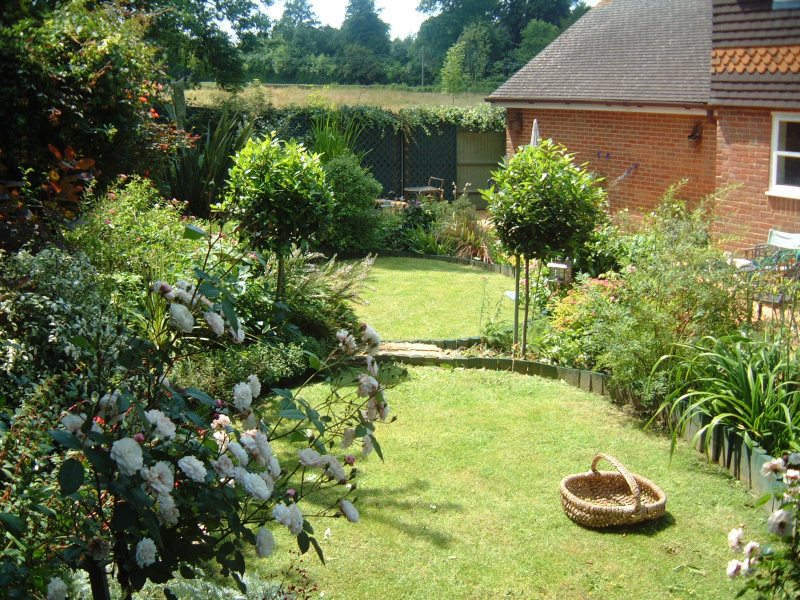 The garden looks mature and well kept, and gives not a hint of its earlier forlorn appearance.